The 2018 AFL Finals got underway on Thursday, September 6, with the top eight teams fighting it out for the right to be deemed premiers. The grand final waas played at the Melbourne Cricket Ground on Saturday, September 29. The Richmond Tigers began their campaign for a second consecutive premiership with a comprehensive victory over the Hawthorn Hawks at the MCG in the first qualifying final. The highlight of the evening was an incredible goal kicked by Dustin Martin in the second term which might well have won goal of the year had it occurred in the home-and-away season. In the club’s first final since 2006, the Demons outplayed the Cats in every area of the game, with only poor conversion limiting the scoreboard damage. 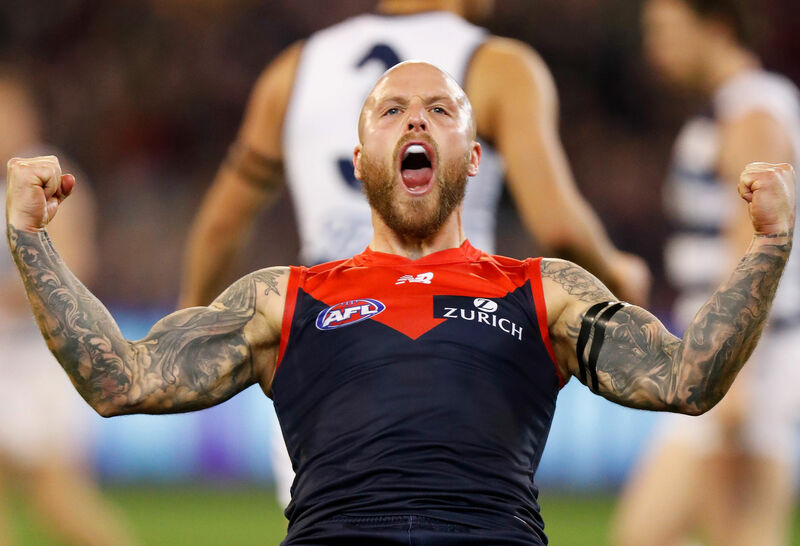 Sam Weideman, James Harmes and Angus Brayshaw were the best three players on the ground, as Melbourne’s younger players tore apart the veterans of Geelong in their first ever final. Weideman in particular was extremely impressive in just his 18th game, finishing with 24 disposals, seven marks and three goals. The 21-year-old has been good since replacing injured Jesse Hogan in the senior team. The contest was done in the first quarter, where Melbourne kicked five goals to nil and left the Cats shellshocked and licking their wounds. The GWS Giants took ultimate bragging rights in the Sydney Derby, demolishing the Sydney Swans by 49 points in an elimination final at the SCG. The heat was on early, the players were on edge and the physicality of the match started as soon as the final note of the national anthem was sung. As expected, the first quarter of this clash was a tight contest. In the second term it became apparent the Swans were simply weathering the Giant storm, Tom Papley scored the first goal, but Sydney failed to score after that. In the end the Giants rolled the Swans, kicking six goals in a row in the second half and twelve behinds in between. The West Coast Eagles ran over the Collingwood Magpies to take a 16-point victory and book in a home preliminary final at Optus Stadium. After a hot first few minutes, the Eagles held onto the ball and kept it in their forward half; a goal to Nathan Vardy out of the ruck and two in a row to Liam Ryan had West Coast off to the start they desired. In the second quarter Collingwood worked overtime to bring the ball to ground and create a manic game of football, allowing them to get back into the game and at halftime find themselves in front by three points. The Eagles kicked the final three goals of the game to complete a 26-point turnaround: Lewis Jetta intercepted on the Eagles’ forward 50 arc and goalled, Jack Darling marked inside 50 and kicked truly, before Jack Redden extended the margin after the siren. In a wonderful night for the Melbourne Football Club, the Demons beat the Hawks at the Melbourne Cricket Ground to advance to the preliminary final. Melbourne were relentless and never wavered from the plan that was laid out by Simon Goodwin. The Hawks did waver. They challenged ferociously, made poor skill errors and at times dropped off in intensity. That, in the end, was the difference between the two teams and the reason the Demons were able to build the wonderful season that threatened to become stunning. The Collingwood Magpies were able to move through the preliminary finals with was, at times, a heart-stopping win over the GWS Giants. They raced out to an early lead courtesy of kicking three goals to none in the first term, but by the final change, the Giants had reeled the margin back in. Despite continued struggles with inaccuracy, Collingwood were eventually victorious – kicking no more goals than their opponents, but ten more behinds. Collingwood crushed former flag favourites Richmond by 39 points at the MCG in the first preliminary final on a clear Friday night. The Magpies kicked the final three goals of the first term to be in front by 21 points at the first break, and sound the first alarm bells for the Tigers. Mason Cox opened the second quarter with three big contested marks and three straight goals, as U-S-A was cheered around the MCG. 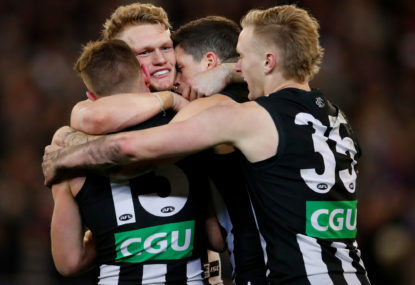 Collingwood finished with a bang, goals to Adam Treloar, Brodie Grundy and Jaidyn Stephenson put the game to rest, it was decided: The Magpies would play in the grand final. West Coast enjoyed one of the most comfortable preliminary final wins in living memory after thumping the Melbourne Demons by 66 points at Optus Stadium in Perth. The match was a one-way street from beginning to end. Without a goal in the first term, the Demons had slumped to a 29-point deficit by the first change. Their work by foot was poor and the less said about the efficiency of their handballs the better. The Eagles were close to perfect, capitalising on any Melbourne errors and hitting the scoreboard as a result. West Coast became 2018 AFL premiers, emerging five-point victors in one of the best grand finals we’ve ever seen. After the Pies got off to a blistering start, West Coast spent the better part of two quarters getting themselves back into the contest, levelling the scores at three-quarter time to set up a thrilling finish.